Editor’s note: Ben Kozary, who you may already know from his articulate and thought-provoking post on why he has decided to leave academia, has become the latest recruit into the InDecision team, giving us a view of decision sciences from the other side of the world in Australia. 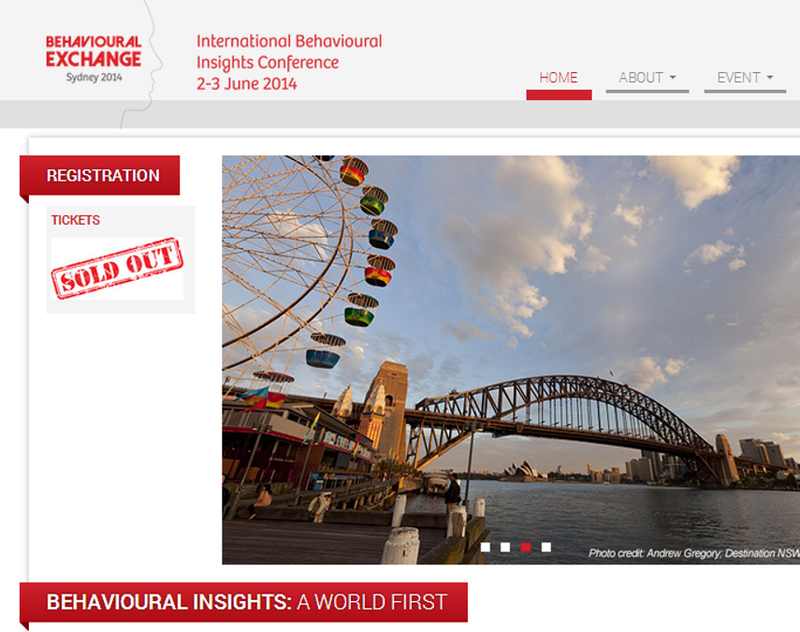 We asked Ben to report on the first International Behavioural Insights Conference in Sydney from the perspective of someone moving from academia into industry – here he reflects on his first experience of the world of behavioural insights Out There. A few days ago, I read an interesting piece on the differences between behavioural economics and psychology. Truth be told, even after attending the inaugural Behavioural Exchange conference in Sydney on June 2 and 3, I’m still not sure what exactly the difference is. But does the distinction even matter? The academic in me screams, “YES!” but, outside of the ivory tower, it seems that most people aren’t concerned. Behavioural Exchange (hereafter referred to as bx2014) was, after all, a public policy conference – and as such, the emphasis of the conference was on actionable and applicable insights from the behavioural sciences. It was the promise of these insights that drew me to bx2014. As a final year PhD candidate researching Consumer Psychology, I was looking to ground the heavily theoretical work I do in some concrete practical applications. My hope was that, in doing so, my work would take on greater meaning, even if only to me – not to mention that I’d be able to pad out the practical implications component of my dissertation. Additionally, as someone transitioning from academia into industry, I was curious as to what the transition was going to entail. Who are the sorts of people I’m going to be dealing with in industry, and how are they similar/different to academics? What value is placed on the skills and knowledge I have, and how might I be best able to apply myself? And how well received are the ideas that I’ve been exposed to throughout my time in academia? In this post, I hint at the answers to these questions but, as you may have guessed, they’re by no means definitive. Nudging: is it just a fad? At this point, you may have noticed that the term “nudging” seems to have been applied as a catchcry for any behavioural intervention. Overgeneralisation may be a common sin of consumer psychology researchers, but our thinking appears more nuanced than that of our industry counterparts. For instance, many of the initiatives suggested or discussed at bx2014 were based upon research describing numerous cognitive biases, including the sunk-cost fallacy, present bias, hindsight bias, confirmation bias, anchoring, and framing effects – but there was almost no mention of the intricacies of these biases, nor any real emphasis placed on the conditions specific to particular case studies upon which they had been used as part of a successful behavioural intervention. Given that I was asked on more than ten separate occasions during the two days whether I’d read Kahneman’s Thinking, Fast and Slow (I haven’t, which apparently put me firmly in the minority of conference attendees), my concern here is that many of the attendees were searching for quick, easily applied solutions to issues affecting their stakeholders. This overgeneralisation is dangerous ground to walk, because it flirts with the prospect of nudging becoming yet another apparent management or political panacea, when it’s anything but. Instead, we need to heed what Professor Cass Sunstein said in the first presentation of the conference; that effective nudging is about recognising individual differences. “Nudges are like GPS units: they tell you the most efficient, or ‘best’, route, but you don’t have to take it; you can go your own way and choose the scenic route, if you like.” In other words, nudges should preserve individual choice by not being overly paternalistic; this is what separates them from mandates. In that sense, I feel that Professor Sunstein was nudging us (if you will) to not overgeneralise. The issue of replication is one that we should all be familiar with by now – and it didn’t go unmentioned at bx2014, either. For instance, Professor Richard Thaler, from the University of Chicago, told us that managers and policy makers generally think they’re right, and they don’t like taking risks; however, they are often too impatient to run experiments, and don’t see the point of replication, with their philosophy being, “It worked already, so why do we need to spend more time and money to test it again?” This problem is an obvious one, but it can be overcome with education and training. A more serious problem with replication was highlighted during the Design breakout session I attended on the afternoon of the first day, where one of the presenters said, “Relative to hard sciences, social science is difficult, because the results will not always replicate. You can implement a nudge or a system of some sort as an effective intervention, but in 6-12 months’ time (or maybe more), people might have adapted and changed their behaviours such that it no longer works – and therefore won’t replicate in any RCTs or experiments you run.” From an academic standpoint, I find this idea intriguing, because it’s something that we rarely consider; we tend to take the more general view that, if an effect is real, it will replicate. I’m yet to hear people’s adaptability offered as a reason for some of the recent failures for studies to replicate – and I’m not saying that it’s necessarily a legitimate reason, but it does highlight something that we as researchers risk forgetting: that there are real people behind our statistics, and they can be unpredictable and subject to change. Big data: how do we use it? So, in the interests of applying something I learned at bx2014, I’m calling this post done. It’s not perfect – but as several speakers remarked at the conference, satisficing is better than optimising. And, at the end of the day, I think that’s a pretty good example of behavioural economics in action.